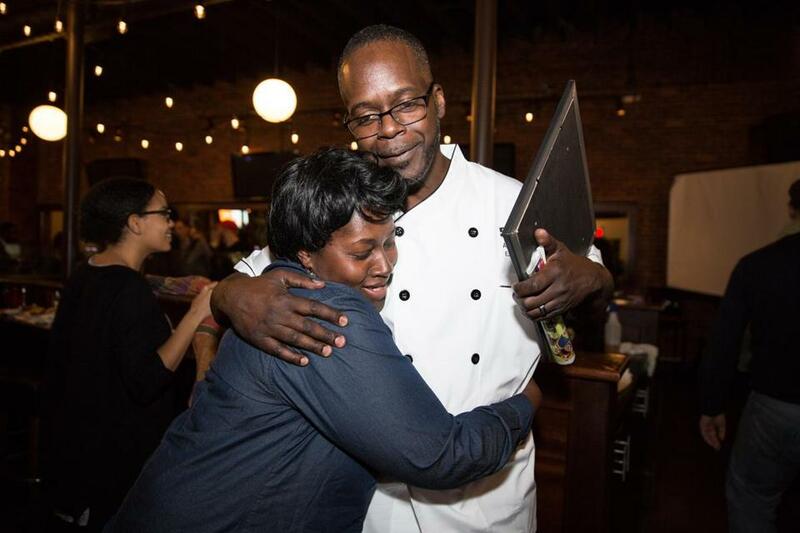 Anthony Caldwell of 50Kitchen hugged supporter Yolanda Anderson after winning the Fields Corner Collaborative’s competition. Caldwell will receive free rent in a storefront on Dorchester Avenue for six months, reduced rent for a few years, and free legal and marketing coaching from other local business owners. An empty storefront on Dorchester Avenue is now the “chance of a lifetime” for chef Anthony Caldwell. The owner of the local catering company 50Kitchen was the winner of the Fields Corner Collaborative’s first ever pitch event Thursday evening. 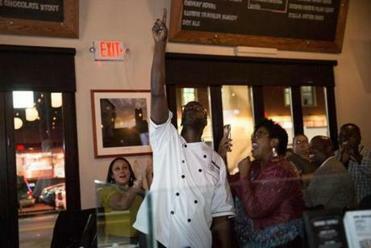 The contest was created by Travis Lee, the owner of the Lenane Building in Dorchester’s Fields Corner neighborhood, conceived as an on-ramp of sorts for a locally owned small business looking for a retail storefront. As the winner, Caldwell will receive free rent for six months, followed by reduced rent over the next few years. He also gets free legal and marketing coaching from other local business owners. The collaborative received more than 40 applications from women- and minority-owned businesses in Dorchester, Mattapan, and Roxbury. It narrowed that group to four finalists. In addition to Caldwell, they included the owners of Yang's Dumplings, Spoke House bike shop, and Lusterity. The finalists made their presentations at the Blarney Stone restaurant on Thursday, where over 200 community members gathered to hear the pitches and vote. Anthony Caldwell of 50Kitchen reacted to the announcement that he won the Fields Corner Collaborative’s retail space competition. “Dorchester is quickly being gentrified, so this is a nice way to counter that and allow more diversity to stay in the area,” said Michelle Miller Groves, one of the judges. Miller Groves will provide Caldwell with publicity for his business through her Social Good Marketing business. Legal coaching will come from the Lawyers Committee for Civil Rights. As for Caldwell, he said it’s an opportunity he’s been dreaming of for years. In his pitch, the Dorchester native explained that he lived in public housing as a child, and struggled through tough times before finding his life’s calling in the kitchen. He’s been working as a chef at Harvard University for the last few years, and preparing meals at his local church in his spare time. That side project evolved into a catering business in 2012, and by last year he was preparing meals out of CommonWealth Kitchen while still working full time. The name 50Kitchen, he said, came by divine providence. Now he’s planning to open a 20-seat storefront serving simple, flavorful American and French-influenced food, with a kitchen for corporate catering. 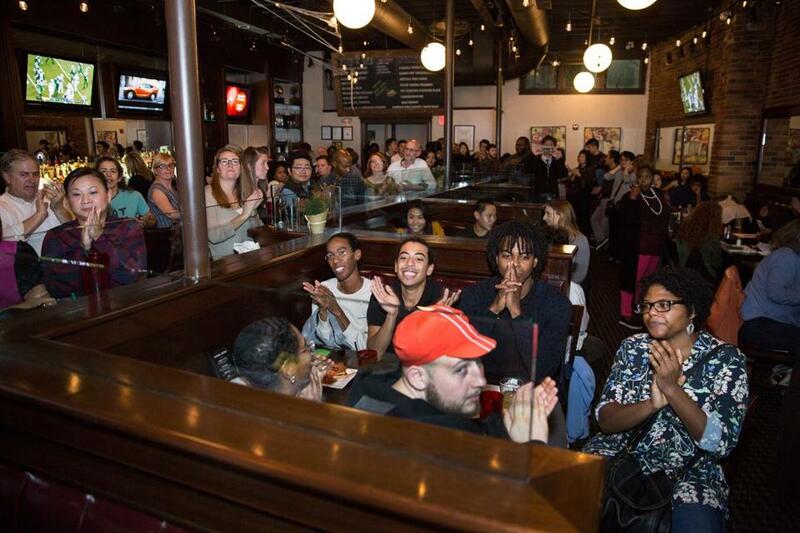 The Fields Corner retail space competition, held at the Blarney Stone in Dorchester, drew a large crowd.